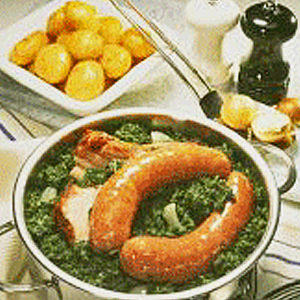 The odd-sounding ingredient Pinkelwurst is a specialty from the Hanseatic Cities in Germany's North. Bring a large pot of salted water to a boil. Plunge the kale into the water and blanch for 1 to 2 minutes. Drain the kale well in a colander and chop it coarsely. Heat the oil in a large saucepan and add the onions. Sauté until translucent. Add the kale and 2 cups water. Stir in the oats and bring to a boil, then reduce the heat and simmer for 30 minutes. Add 1 cup water in 1/4-cup increments, if necessary. The stew should be very moist but not soupy. Add the pork loin and the Pinkelwurst, and cook over low heat for 30 minutes. Add the smoked sausages and up to 1/2 cup water, if necessary. Cook for 30 minutes. The smoked sausages should only be added for the last 30 minutes of the cooking time, otherwise they will burst. Season with salt, pepper, and nutmeg. Serve with boiled or caramelized potatoes.